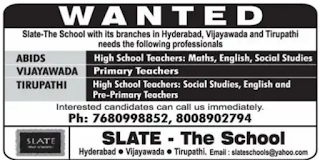 Slate The School, Hyderabad, Vijayawada, Tirupathi has advertised in Eenadu newspaper for recruitment of Teaching faculty jobs vacancies. Interested and eligible job aspirants are requested to apply or call immediately . Check out further more details below. About School: Slate - The School was started in the year 2001, by Vasireddy Educational Society, with a vision to impart quality and value based education to children; to improve the ethical standards in the field education; to adopt a futuristic approach to promote traditional values amongst the younger generation. Job Location: Hyderabad, Vijayawada, Tirupathi. How to Apply:Candidate can call or apply immediately. Reference: Advertisement on Eenadu newspaper Dated 1st June 2018.